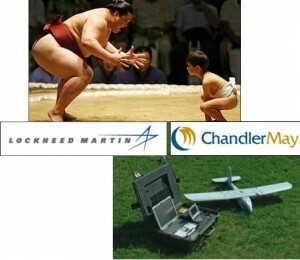 Lockheed Martin acquires ChandlerMay for an undisclosed amount. The new acquisition will join Lockheed’s Mission Systems & Sensors (MS2) business. ChandlerMay, with facilities in Huntsville, AL and San Luis Obispo, CA, has produced over 2,500 UAVs for the military, mostly as a subcontractor to Lockheed. ChandlerMay also produces UAS ground control stations and tactical systems software and support. Lockheed’s MS2 focuses on UAS including the unmanned K-MAX helicopter the Marines are testing in Afghanistan, the Desert Hawk UAV (which ChandlerMay produced), and provides systems engineering, software development and management.